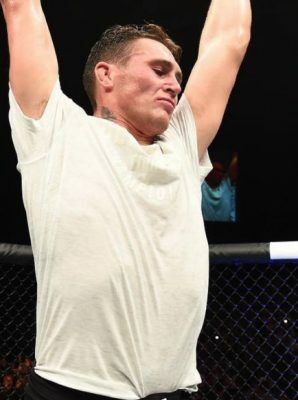 Dustin Poirier added a signature win to his record by defeating former lightweight champion Anthony Pettis on Saturday night in the main event at UFC Fight Night from Norfolk, Virginia. The fight ended up as a bloody war after Poirier opened a pair of cuts on Pettis’ face that began seeping everywhere on the fighters and the canvas in a wild and crazy bout that came to an end in the third round. Poirier was very smart with his game plan throughout the fight as he continuously looked for takedowns to negate Pettis’ world class striking while also punishing the former champion with punches whenever they would get locked up against the cage. Of course, Pettis wasn’t going away easy because he returned fire during every exchange and went for a pair of triangle choke attempts that looked to put Poirier in trouble. Unfortunately for Pettis it was his second triangle choke try that ended with Poirier on top of him, landing a series of vicious elbows with the final one opening up the cut that began pouring blood into his eyes. While the doctor did check out the cuts on Pettis’ face and allow him to continue, Poirier was just unrelenting with his attacks and he kept pressing forward, getting the fight to the ground and then doing maximum damage on the mat. Finally in the third round, Poirier transitioned to take Pettis’ back where he locked up the body triangle and started searching for the rear naked choke. Pettis did his best to defend and that’s where he turned in an attempt to roll out of the position but instead it appeared that he popped a rib while twisting with Poirier still holding onto the body triangle. Pettis immediately tapped out with a grimace on his face due to the pain from his ribs as Poirier was declared the winner at 2:08 into the third round. Afterwards, Poirier wasted no time telling the UFC matchmakers exactly what he wanted following his latest win inside the Octagon. Of course, Poirier has history with Alvarez after they faced off in an epic battle earlier this year that came to an unfortunate end following illegal strikes being landed the referee stopping the fight and declaring it a no contest. Poirier has been champing at the bit for another shot at Alvarez ever since but it sounds like he would be happy to take on Gaethje as well if he’s victorious in their matchup at UFC 218 on Dec. 2.